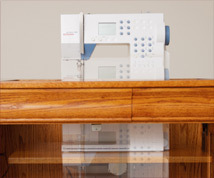 Our Sewing Center III gives the surface space of a Quilter’s Delight while still providing a spot for your serger. 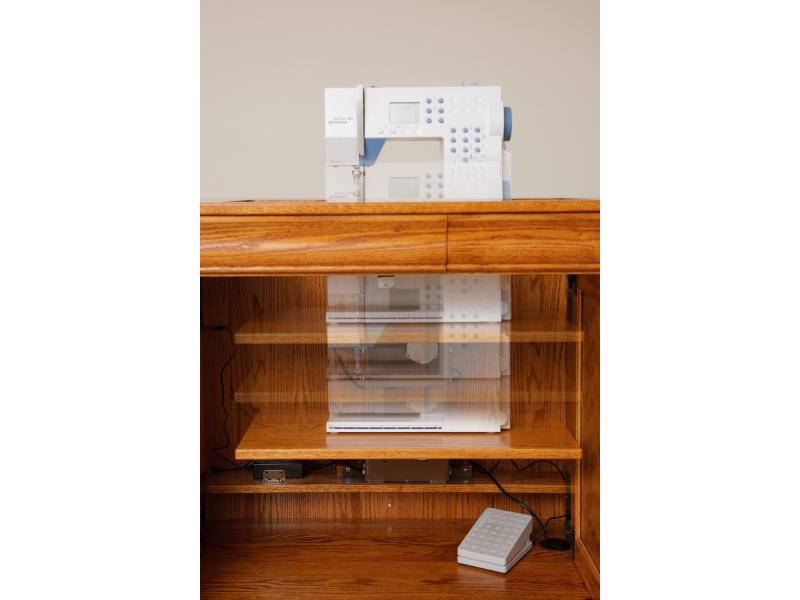 When the Quilter’s Delight shelf out the back is up, the Sewing Center III has a depth of 45”. 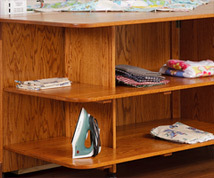 Another feature that comes with our Sewing Center III is an extra table to the front left. In our standard model, we build this table to rest on the top drawer. When not in use, it can be stored in a closet. 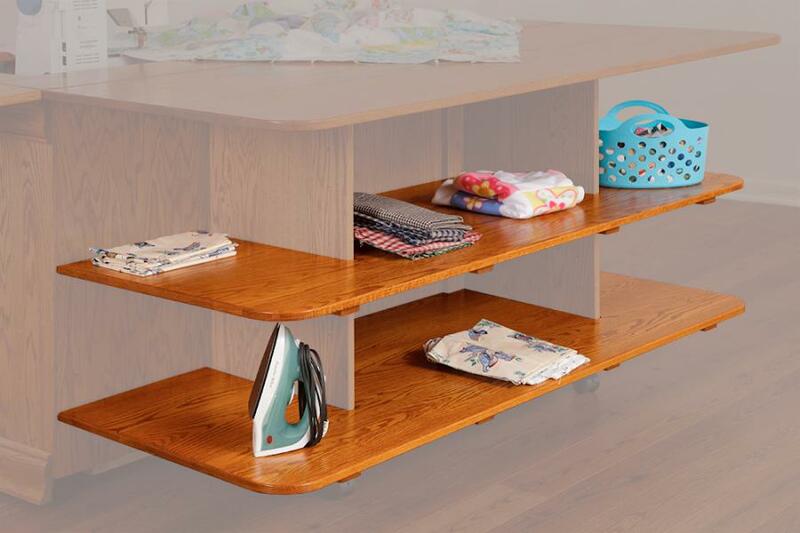 We have custom-built the sewing center by making this a pull-out table. 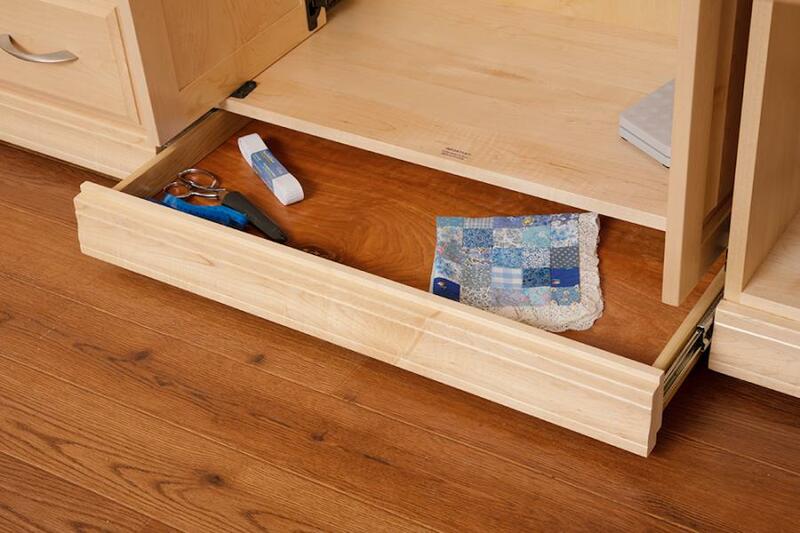 However, when built this way, you need to sacrifice drawer space to allow for storing the table inside the cabinet. 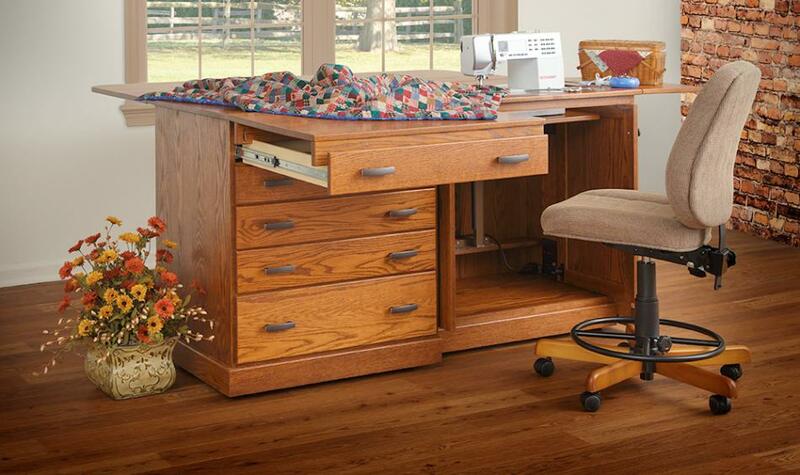 This extra table adds 20” to your work space, making a nice area for sewing a quilt together. 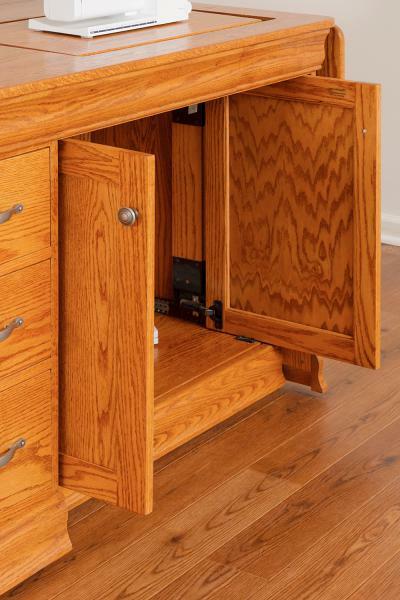 Although drawer depth and height are the same as the Sewing Center II, the Sewing Center III boasts drawers that are 13 ¾” wider than the II. 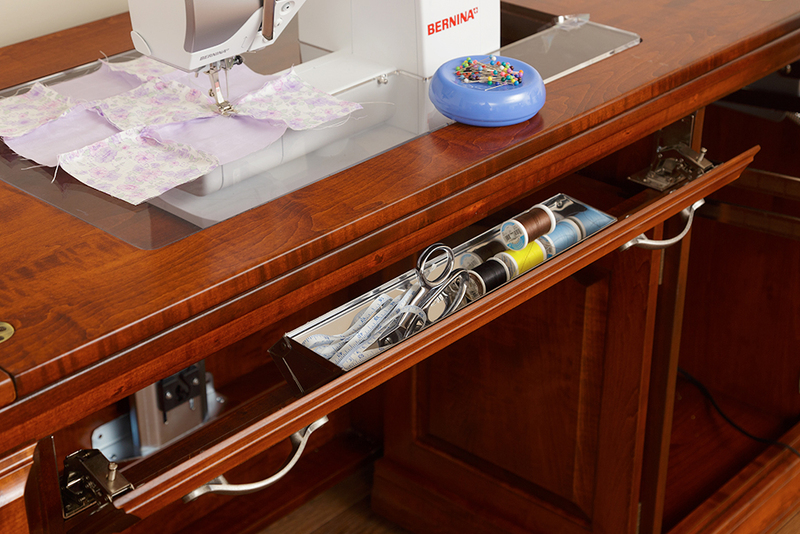 More storage space lures our customers into buying the Sewing Center III! 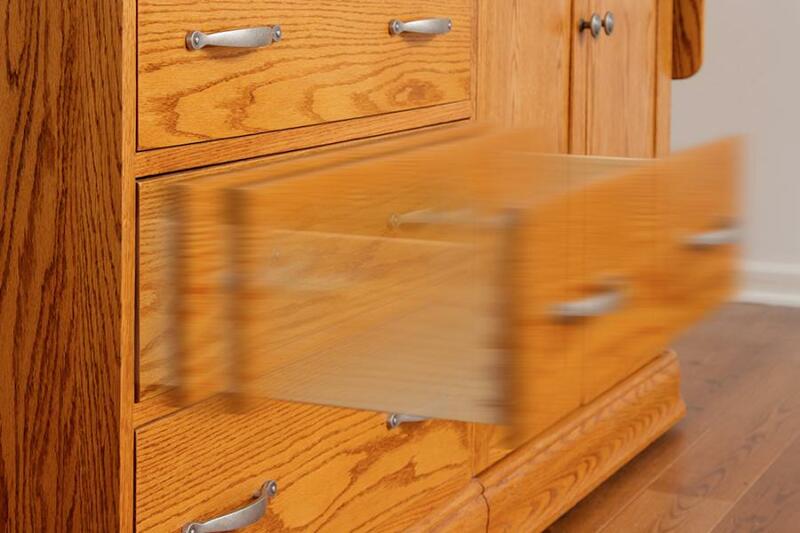 Keep in mind that drawer sizes can vary slightly depending on the style of cabinet you choose and whether you ask for the soft close drawer option. Are you hankering for more storage space? 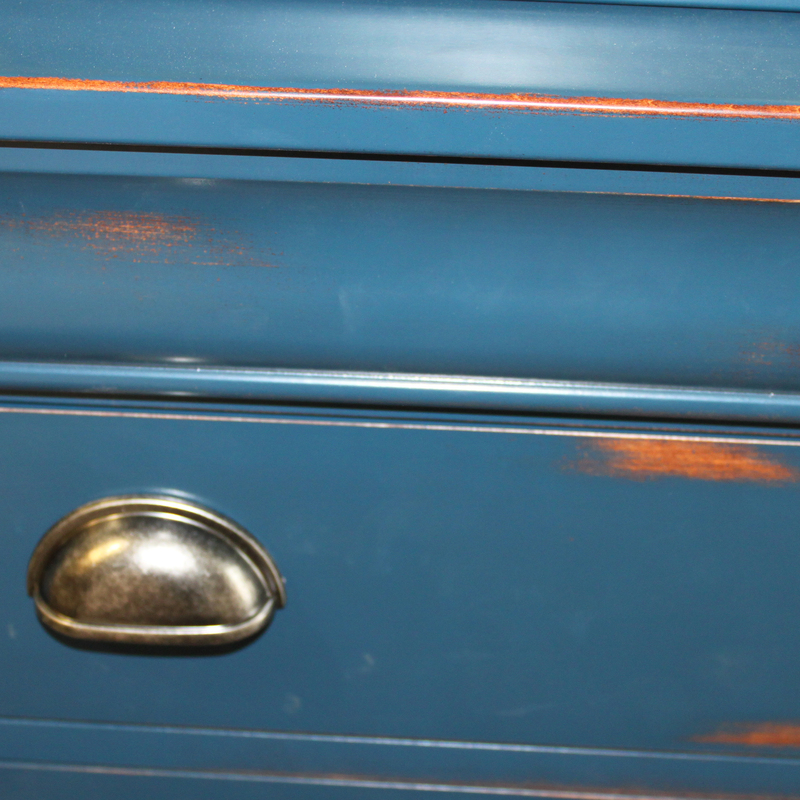 Would you like to utilize the right side of the cabinet for more drawers instead of a serger? 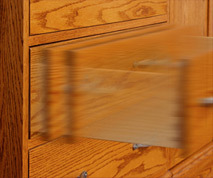 We can customize the cabinet with drawers instead of the serger lift. Ask for our spool organizer to keep your thread neat and tidy. Sewing Center III holds sewing machines up to 24”. 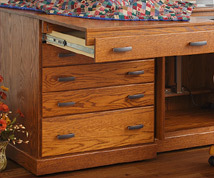 Don’t forget that we are offering to build you a quality, solid wood sewing cabinet, tailored to your specifications. Contact us now for more information! The Sewing Center IV boasts more surface area and bigger drawers while still bringing you the same great features as the Sewing Center III. 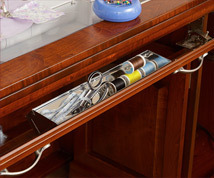 The drawers of the Sewing Center IV are 26” wide by 20 ¼” deep. The top drawer is 3” high, the two center drawers are 3 7/8” high, and the bottom drawer is 7 1/8” high. Again, the drawer size varies slightly when purchasing the Le Chateau style or adding the soft close drawer option. The Sewing Center IV is 4 ½” wider and 4” deeper than the Sewing Center III. It handles sewing machines up to 24” long. Did you notice our back shelf kit in the options below? 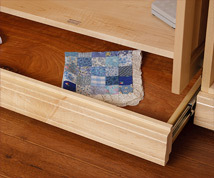 Ask for these shelves to give yourself more room to organize your quilting and sewing supplies. Create a place for everything, and it will be much easier to keep everything in its place! 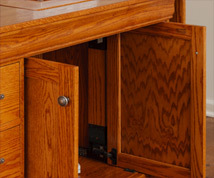 Contact us today, and we will help you create the hardwood Sewing Center of your dreams! Sewing Center III in cherry with Traditional stain in Le Chateau style.